In the photo above we can't see the actual buildings. Obviously, we know the buildings are really there because we see the reflection. As believers, we should be reflecting our Saviour, Jesus Christ. People should know that He is because they see His reflection in us. Just like we know those buildings are there because we see their reflection in the water. That's a sobering thought! Do people see Christ is you? In me? I certainly hope so. I know that fellow believers often see Christ in one another, but does the lost world see Him in us? If you've "grown up" in church, you've probably heard that you may be the only Bible some people ever read. If that's true, what are they reading? Do they read about mercy, grace, and love or are they reading about judgment and hypocrisy? More and more I understand that God is the only Judge. So long as I breathe, I am to extend mercy, grace, and love. That's what God has given to me. Yes, I understand that He calls us to live above reproach and to walk blamelessly before Him. But that call is to believers, not the lost world. AND, He guides, directs and disciplines us Himself. I think we, Christians, often expect the lost world to behave like Christians and they can't. But we can and we should. So, whose reflection are you? 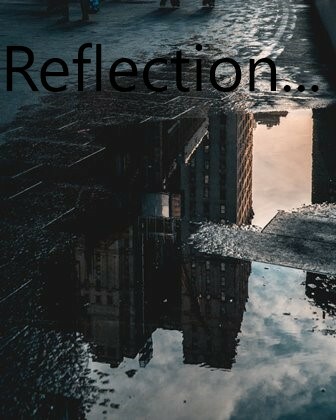 Whose reflection do you want to be?